Beautiful 2-color, two piece Maui Christmas Laser Cut on textured card stock. 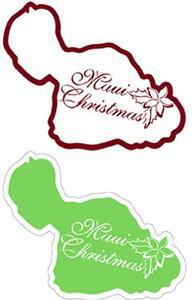 Includes a top layer with intricate details of the word Maui Christmas and a plumeria flower. The solid bottom layer provides contrast and makes the laser jump off the Page. Pieces are separate so you can assemble flat or create a 3-D look with foam adhesives. Perfect for your Hawaiian or Tropical Scrapbook album! Dimensions: 3.75" x 6.5"